Patients with metastatic renal cell carcinoma (mRCC) have variable clinical outcomes to treatment, and identifying the underlying molecular markers may help predict response to therapy. 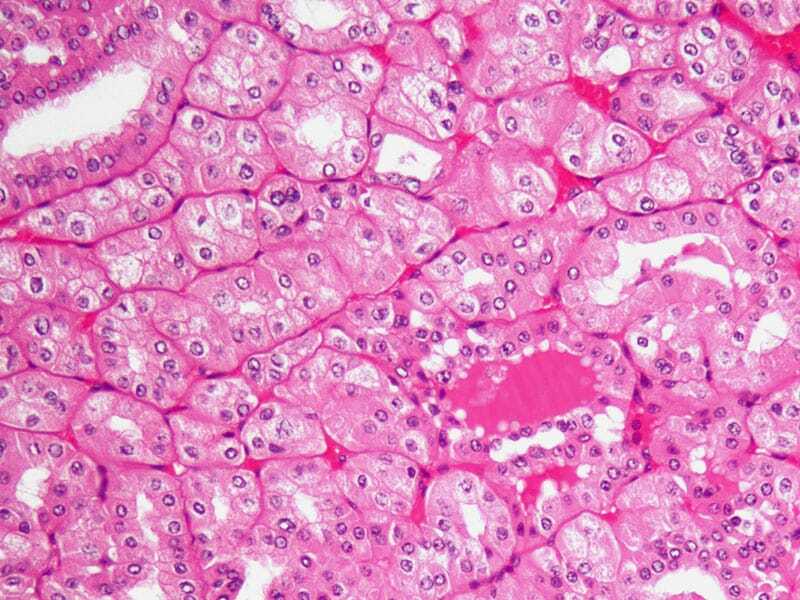 Two studies presented here at the 14th International Kidney Cancer Symposium (IKCS) report preliminary data that may eventually allow for more individualized therapy. “We need to keep looking for biomarkers in renal cancer, and we are making progress, but we still have a long way to go,” commented Jaime Cajigas, MD, director of the oncology section, Sociedad Colombiana de Urología, Bogotá, Colombia. In the first study, David Gill, MD, from the Huntsman Cancer Institute, University of Utah, Salt Lake City, and colleagues found that PD-L1 expression correlated with poor outcomes in patients with metastatic clear cell renal cell carcinoma (mccRCC) who were treated with high-dose interleukin-2 (HD IL-2). Renal cell carcinoma has been recognized as an immunoresponsive tumor, which has led researchers to look at immunomodulatory strategies to stimulate antitumor activity. For treatment with HD IL-2, the response rate is about 16% to 20%, with about 10% of patients achieving a complete response, explained Dr Gill, who presented the findings of their study. “Notably, many of the complete responses are long-term responses,” he said. However, he noted that treatment is limited by an acute toxicity profile, although relatively few long-term toxicities occur between treatments and after completion of therapy. Clear cell carcinoma expresses PD-L1 to a grater degree than other renal cell variants, and it has been associated with decreased immune response, he pointed out. The cohort included 58 mccRCC patients who were receiving HD IL-2 and who were available for immunohistochemistry analysis. The patients’ median age was 55 years; the majority were men (78%). Of the 58 patients, 8 (13%) were classified as being of favorable risk, in accordance with the International mRCC Database Consortium (IMDC) risk categories; 42 (72%) were classified as being of intermediate risk; and 8 (14%) were classified as being of poor risk. PD-L1 tumor positivity was defined as 1% tumor cell membrane staining. Nine patients (16%) had 1% PD-Ll expression; 6 (67%) were IMDC intermediate risk, and 3 (33%) were poor risk. The findings showed that an increase in PD-LI was associated with decreased overall survival (OS) and decreased progression-free survival (PFS); both were statistically significant. OS was decreased to about 13.7 months from 37.3 months when PD-LI was expressed (P = .0069). Results for PFS were similar: 3.1 months vs 7.3 months (P = .088). Six patients (12%) had a complete response to treatment, compared with no patients with PD-L1 expression; four patients (8%) had a partial response vs one (11%) among the patients with PD-L1 expression. The overall objective response rate was 20% for those without PD-L1 expression, compared with 11% for those with it. In the second study, the researchers looked at molecular predictors of response and survival outcomes in patients treated with vascular endothelial growth factor tyrosine kinase inhibitors (VEGF TKIs). VEGF TKIs are the standard frontline treatment option for patients with mRCC, explained lead author Neeraj Agarwal, MD, associate professor of oncology at the the University of Utah School of Medicine, Salt Lake City. “However, patients have very variable clinical outcomes, and identifying clinical markers predictive of response to therapy has the potential to allow for better selection of patients,” said Dr Agarwal. To assess potential biomarkers that might be indicative of therapeutic response and survival patterns, Dr Agarwal and colleagues assessed genomic DNA that was extracted from macrodissected formaldehyde fixed-paraffin embedded (FFPE) tumor tissue sections of 86 mccRCC patients. A total of 65 patients had responded to therapy. Of those, the responses of 16 were long term (defined as PFS > 18 months), and of 21, short term (PFS < 6 months). For the genomic analysis, the patients were divided into three groups, explained Dr Agarwal. These consisted of patients with long-term response vs short-term response; those with a clinical benefit vs those without a benefit; and patients with an objective response vs those who did not have one. Gain/loss was evaluated by array-CGH and differential copy number alterations (CNAs) associated with survival outcomes. Best objective responses (complete response, partial response, stable disease, progressive disease) were identified using Fisher’s exact test. Nucleotide variants were detected by massively parallel sequencing using a custom hybrid capture panel of 76 frequently mutated genes and 16 prognostic single-nucleotide polymorphisms in RCC. They found that the gain of 10p15.2-p15.1 was significantly enriched (P < .05) in 20 patients with short-term response to VEGF TKIs, as compared with patients with long-term response. It correlated with poorer outcome (P = .04) in the remaining patients. In all 16 patients with long-term response, 11 CNAs were significantly enriched, and only one, 5q14.3 gain, was associated with favorable outcome (P = .01). When looking at objective responses, nine CNAs were significantly different among patients who had a complete/partial response or who had stable disease vs progressive disease, and eight CNAs differed between complete/partial response vs stable disease/progressive disease. Sequence information was available for 18 patients with short-term response and for 10 with long-term response. Mutation frequencies of VHL, PBRM1, BAP1, and SET02 were as expected, said Dr Agarwal. “Several copy numbers in metastatic RCC were predictive of response and outcomes to treatment with VEGF TKIs, and we are hoping to further validate in a larger cohort,” said Dr Agarwal. 14th International Kidney Cancer Symposium (IKCS). Presented November 7, 2015.